Christine. Lord Strathcona and Mount Royal. Was born in 1820, and educated in Scotland. He entered the service of the Hudson Bay Company, and has been one of the leaders of Canadian progress. For his services to the Dominion he was created a peer in 1897 by Queen Victoria. 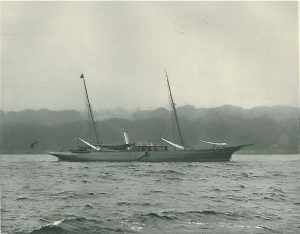 Lord Strathcona has devoted much interest to the establishment of yachting as a Canadian sport, and he is Honorary Commodore of the Royal St. Lawrence Yacht Club. Lord Strathcona owns the s.y. Merag, 203 tons, and cruises largely on the West Coast of Scotland. Clubs: Royal Highland, Royal St. Lawrence. Residences: 28, Grosvenor Square, W. ; Knebworth, Herts ; Debden Hall, Essex ; Glencoe House, Argyllshire ; Colonsay House, Isle of Colonsay.